A.S.K.A. Dojo Nov. Newsletter . Welcome to our first attempt at an on-line version of a dojo newsletter! Ever since Hombu abandoned their nicely done, but sporadically presented newsletter, we've been seeking to create something comparable for our students. Sensei Gene and I had tossed the idea at one another periodically, but until now, neither of us has taken the sword by the saya and drawn. Figuring that we've been without far this sort of item for far too long, I decided to draw first, so for whatever it's worth, to the victor go the spoils (that would be you guys…), so enjoy! First, let's begin with an explanation of “November's Cover Boy”, the print of the samurai that appears above. He is one of the famed 47 Ronin. This is a copy of one of the woodblocks that we were able to view directly at the Hawley library several years ago. Panchita Hawley designated Jeff sensei “Official Print Handler” and made him wash his hands with special soap so he and we could view the prints. The rest of us looked on while Jeff carried out his duty--he was the only one allowed to touch them! Getting back to the chap pictured above, note the snappy accessories displayed at his feet and the stylish head that he's sporting over his right shoulder! We're not sure who he is, exactly, but we think you'll agree that he wears his trophy head well! Ichiyusai Kuniyoshi, a famous artist, produced the series of 51 prints, along with an account of the incident in 1847. The full series is being compiled into a book by Hawley library and will (hopefully) be published soon. At last notice, they ran into some difficulty in completing this project, which has delayed its release by more than a year, but they, like the 47 ronin, are persisting in their efforts! Those interested in what other treasures are available at the Hawley library check on the web at: http://www.wmhawley.com/htm. For those of you who have yet to make to one of the hombu training trips featuring a visit to Hawley, you're really missing quite an experience! It's my one of my all time personal favorite places. There's a legend of an emperor who is asked to judge a contest among local artisans to select the painting that best portrays “serenity”. After painstakingly examining dozens of pictures by very talented and thoughtful artists, he narrowed his choices down to 2: one depicted a pastoral scene of the most beautiful and tranquil setting ever set down on rice paper, with blue skies, bright sun, lush greenery, vibrantly colored fields of flowers in the background, and a cascading waterfall rushing from a hillside into a sparkling and still pond. In contrast, the other picture highlighted fierce bolts of jagged lightening and torrential rain set against a sky filled with, dark, thick, smoky colored clouds and a steep, forbidding craggy gray cliff in the foreground. The monolith was bereft of any sign of life save for a lone bird resolutely yet calmly guarding her 3 tiny eggs in a small nest in one of the cliff's numerous fissures. Pop quiz: of these 2 pictures, which do you suppose the emperor ultimately chose, and why? The correct answer appears at the end of the newsletter. 1). Testing: Sat. Nov. 16th at 1 p.m.! Yes, it's now official! As previously noted, test invitations will be handed out on Thurs., Nov. 7th, and at that time, those who are now borderline in attendance will be advised of their status (that is, whether or not they will be required to complete an additional test-day regimen to make up for their absences). As for the accounting, there's 38 classes available for attendance between the July test and Nov. 16th date. There are 4 classes remaining. The 60% attendance requirement makes 23 the magic number required for unrestricted (meaning; no extra activity) testing. The moral of the story is: make classes to build your skill, or end up working much harder at test time to make up for it! Sat. Nov. 16th starting at 5 p.m.! Yes, now this is official too. After much wrangling over the date and trying to accommodate the quirks in everyone's schedules, we figured that this is the best option. This will be held at the usual location: our house. The format is pot luck, and as usual, we will provide the main, meat-type thing and Marlene sensei's sparkling fruit punch, as well as water and green tea for beverages. One change, however: this time, in keeping with our bid to nurture an appreciation for healthier food for our hard-training warriors, we'll have everyone “pre-register” to bring items from various categories to insure a greater variety. We're seeking to avoid the all-too prevalent presence of dessert-type items that has been the case at previous events. It seems that Parker has already called the ball on the dessert this round with his offering of….well, it's a secret (but you'll like it, trust us!). There's still plenty to choose from on the list, and when in doubt, meat items can always be overlapped (working muscles need it for growth and repair)! We will have the list available for sign-ups by this coming Thurs. Our feature film this round is called “Doraheita” (this means “alley cat”). It's an interesting film about a town administrator who is sent in by a mandate of the imperial court (sort of…) to “clean up” a castle town that is prospering “a bit too much” from the shady activities within an adjacent Reno-type fief across the bridge. There's interesting fight scenes, frequent splashes of humor, as well as lots of intrigue. We think you'll really enjoy it, so mark your calendar! Oh! BTW, did we mention that we now have a shiny new TV to watch it on? Yup, the old one with the funky colors finally bit the dust, so we were forced to get a new one (boo hoo…not!). It's a Toshiba, the screen is a bit larger and now only the blood of the vanquished is red, unlike the pretty much ubiquitous red seen on just about everything as the old model faded into the sunset….the sound on this one rocks too, so bring your earplugs if you're skittish! 3). Training in the Park Sat. Nov. 9th, 8 a.m.
For those of you who either haven't received, or haven't yet read the AZ-L announcement, there's going to be a multi-dojo training-in-the-part session on Sat. Nov. 9th! Freestone Park is located on Lindsay Rd. with an entrance (on Lindsay) south of Guadalupe on the north side. The premier feature of training at this location besides the fresh air and huge open space is doing kumite and other exercises on the rather steep hills there. Totemo omoshiroi (very fun/interesting!) For those who are new to this type of training, it will give you a whole new perspective on what the samurai must've had to deal with in battle, and for those who have experienced this before, it's a chance to focus on some particular aspect of training such as strategic advantages of a given stance or position on an incline, ect. At last notice, sensei Gene was also talking about inviting sensei Paul Pocock (a.k.a., the “Thunder from Down Under”) and his students, so you may have a chance to meet some new Shinkendoka. Gene was proposing an hour of training, but we always manage to run over, so if you have an itinerary, please bring a watch so you can mark your time. A couple of you may be aware that sensei Jeff and I have been seeking to get a stand of bamboo going in the bordered garden area of our yard so we can enjoy the benefits of enhanced shade with an Asian flair, along with a ready source of cutting fodder. From our investigation into the topic, bamboo is quite the plant from a variety of perspectives. My search began at a local nursery (Harper's, on McKellips just west of Gilbert) that I recalled had some in pots some time back. I revisited the topic with them, and their cuttings are taken directly from a rather large (!) stand that they have right there on the premises (in case any of you want to go over to have a look and fantasize about being asked to “clear” it!). The variety they have goes by the common name of “giant timber”, and trust me, it lives up to its name! Even the canes in the pots (or “culms” as they're also called) are at least 8 ft. tall, and the “mother” stand has got to top some 25-30 ft.! So, is there a hunk of this stuff now growing in our yard, you inquire? Well, no, not yet….it seems that there are some caveats that come along with bamboo, so read on. …is that there are two general categories and not many people know the difference between them when they set out to make it a part of their landscape: there's the “running” variety and the “clumping” variety. Each variety has its own merits and evils, with the “running” variety being particularly tricky to deal with due to its nature. It's known for being extremely hardy and for growing quickly and easily…and this is both the good news and the bad news. The stuff is apparently so vigorous and hardy that it will easily take over even an established yard if left untended and will prowl over, under, around and through objects like cement abutments, block walls and the like. In some areas, bamboo has been dubbed a “nuisance plant” due to these attributes and is not looked upon with favor. It's been recommended by both Harper's and A & P nurseries (as well as some web pages we looked at..) that if you're going to plant the “running” stuff, you should likewise plant some swaths of sheet metal about 3 or so feet into the ground around it to go along with it for containment! The sad thing is, the “running” variety generally seems to grow to greater heights and with greater cane circumferences than the “clumping” variety with some running varieties reaching a height of up to 72' (yes, feet!) with a cane diameter of up to 5' around! And, in spite of their preference for warmer, wetter climates, many varieties can survive both droughts and sub-zero temperatures! However, this is merely a comparative observation, because when viewed in singular, the “clumping” variety ain't no slouch when it comes to growth and hardiness either really-it's just not as “pesky” about its presence in the scheme of things. Many of the “clumping” varieties can reach heights of 15-25 feet with a cane diameter of 2-3 inches. Not the gargantuan beastie that the runners are know to be, but hey, these should be sufficient for the purposes of most advanced tameshigiri aficionados. This variety can also survive a freeze and be tolerant of a less-than-vigilant watering regimen, but it has the grace of not overrunning your yard-it seems to prefer a more modest group bonding strategy and thus is largely self-containing with minimal effort. The bad news is the 5 gallon pots available at A & P were $125.00 each! The pots of runners at Harper's likewise were “chotto takai” at $95.00 for a 5 gallon pot. Thus, we are doing without at present. …besides the fact that the books at the nursery noted some 36+ different varieties (and I'm told this is a conservative representation of the actual number…), is how many uses it has (besides shade and cutting fodder, that is)-it's been used for all manner of eating and drinking vessels, for musical instruments, furniture, housing and building structures both inside and out (apparently, bamboo scaffolding has been known out-live more modern materials in a typhoon...), its edible (ever hear of “bamboo shoots”? ), and from a web-page Jeff stumbled onto, makes a mighty slick looking (and probably very durable) flooring! At any rate, we will very likely invest in and plant some of the “clumping” variety in the next couple months or so, that is, unless that little sprout that's been turned loose in our yard turns out to be a runner… In which case, if we suddenly don't show up for training some night, send out a search party as we're probably lost in the grove…and, oh yeah, by the way, be sure to bring your swords!! If you're interested in reading more about bamboo, one of the web sites we checked out that is particularly informative is as follows: http://www.ces.uga.edu/agriculture/horticulture/bamboo.htm. As I may have noted on my test page, due to the unpredictability of our schedule, I'm not yet certain how often this newsletter will be presented so I will not commit to a hard-core time-line. I suspect that a great deal will hinge upon how much free time I have (or not) at any given point, plus the number of announcements, the availability of outside submissions (meaning: outside of mine! ), and my inspiration as well. However, I'm going to try to make this as “impromptu friendly” (read: simplistic) as possible so I can toss it together and ship it out at the drop of an obi so I'm hoping that it can appear at semi-regular intervals. My last attempts at newsletters for both our group and Jerry's were a great deal of time-consuming work and ended up mostly consisting of my articles after chasing others about for contributions that ultimately failed to appear for 3 months at a crack. I'm hoping that this will not be the case here. As such, I heartily encourage submissions, to be submitted in the form of a Word document via an attachment to an e-mail to facilitate the process. My time is at a premium, so I don't wish to re-type documents. As for pictures, we do have a scanner, so if your want to submit a visual you can likewise either e-mail it as an attachment or give it to us to scan in, but it will become a “read-only” image, so it will be handed back to you for editing if changes are necessary! At this point, we would like to remind students that the purpose of training far exceeds issues surrounding gaining rank and bragging rights. Training in Japanese sword can facilitate a plethora of positive physical and psychological processes: improved strength and stamina along a number of dimensions, enhanced knowledge of strategy, balance, coordination, focus, knowledge of martial and samurai history, working effectively with a partner, self-control (of both body and mind), insight into one's self-one's strengths and weaknesses (and how to bolster/overcome them respectively…. ), and the list goes on. 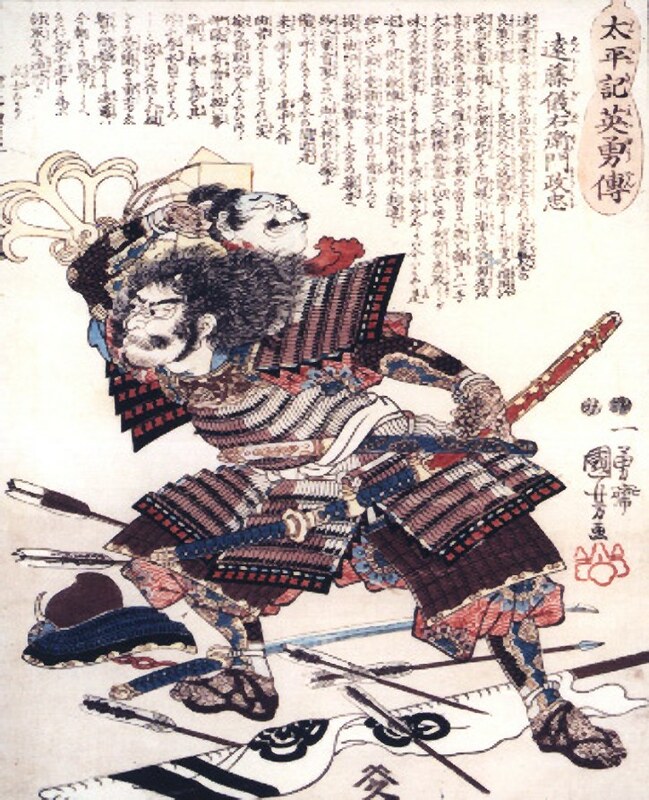 Even back in the days when sword skill was used for its most obvious application-defense of lord, self, and home, the emphasis in training for the more cultured samurai, according to the history books, still had a foothold in personal development. This is a theme we plan to continue as a way of honoring the wisdom of the ancients and a generally desirable goal, the teachings of a truly learned martial artist, Obata Kaiso, and the potential of each and every one of you as students. So, learn to look upon your training as more than simply a pastime, hobby, or a vehicle with which to gain “status” (whatever that is…), as it is really so much more than that-it is, above all, an exercise in helping you to be the best you can be! Answer to the little “zen koan” (meditative riddle) appearing above: The emperor chose #2, of course! Why? Because it's very easy to be serene when in the midst of a pastoral, peaceful setting, when all is well and there are no threats. The true test of serenity is when the ka-ka is hitting the proverbial fan by keeping one's focus and staying on task regardless of what is going on around you, as exemplified the tiny bird. Serenity is generated from inside out, not the outside in! HINT! HINT! The sooner we receive some article submissions, the sooner we will be able to put out another newsletter, so get busy!